Haha yeah i only just found out from a friend, totally wasn't expecting that. 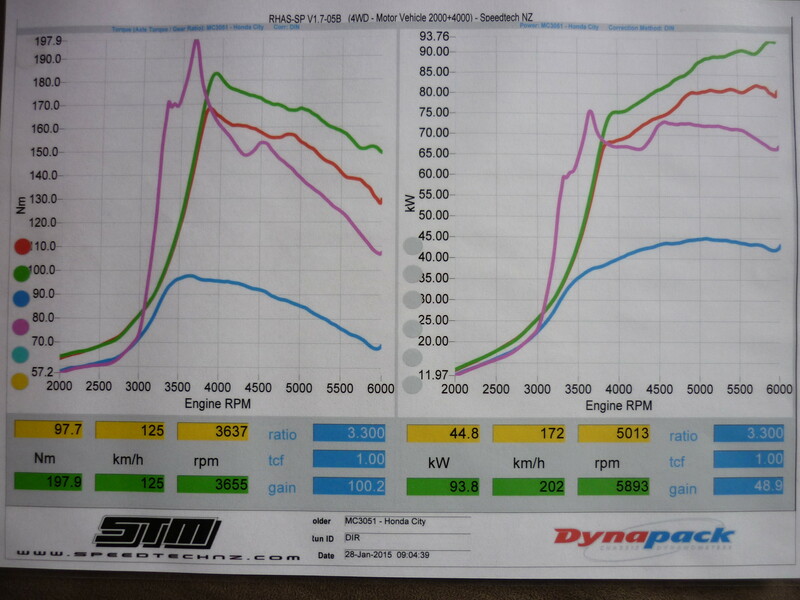 I've been meaning to post up the dyno charts to show how disappointed i am at the lacking of power on the dyno but that's not to say the car isn't performing, in fact its running really consistent now & didn't miss a beat on the dyno. Anyway this time i only got 94wkw which is 9wkw less than the other dyno, so it goes to show there is a massive power difference between 'Rolling Road' & 'Hub' dynos (DynaPac). STM did say their dyno is a low reading dyno but at least the figures are more likely to be accurate & not overrated so i would rather take the lower power figure to be the more realistic one. Just pointing out that STM use Dynapack dyno's that are bolted to the hub & the other dyno's i've used are in Hastings & Tauranga which are Rolling Road Dyno's which are drum rollers that the car is driven on so theres no need to calculate the wheel diameter/circumference for wheel speeds as the drum is already calibrated. As for the nitrous well damn i was way off, i can't work out how the nitrous seems to perform better than running HI BOOST which is almost 20wkw more, the only thing i can put it down to is that the nitrous creates so much torque down low that it compensates for lack of power, down side to the nitrous is that the torque drops rapidly as the revs climb, i don't know but it feels better than on 24psi boost. One thing to take note of is that the T1 injectors started to lean out at around 22psi, although still ok the tuner said it just falls below the safe A/F ratio, so with that said about 20psi is about tops for T1 injectors & they have a good A/F ratio on 18-20psi, note that i am running a VL Commodore fuel pump & adjustable fuel pressure regulator which is likely to help with fuel delivery. Blue - 10psi boost with igniton retarded around 5degree (ready for nitrous so power is right down), probably would have made between 50 & 55wkw if timing was set to normal. Last edited by KingCity on Sun Feb 08, 2015 9:26 am, edited 2 times in total. Ok only two weeks away from the next drag meet at Meremere & things all look set to go although i found that i have cracked another injector. Now im not to sure if its due to there age of these injectors but im starting to think that even though standard T1/T2 injectors can flow enough fuel for over 20psi boost i don't think they can handle the fuel pressure delivered which is causing them to leak/crack, i do have spares so will swap but i wander if i should go back to the Prelude ones as i never had an issue with them leaking but the car will run really rich again. Well i went to the drags on Friday but couldn't get close to my personal best so im starting to think i just got really lucky with that 14.1 a few years back. The best i could do this time was a 14.6, my 60 foot times were slower & down a few mph over the line so this could be due to the engine being tired & using different tires & wheels, either way it doesn't look good for that 13 second pass, i still haven't used the nitrous on a run yet though. Also the car ran great all evening without a single issue & was consistent with six of the 11 passes that evening in the 14.6's. Found this City on Youtube, apparently its got a B18c in it but cant find any info on it but yeah anyway here are the links below. Its been playing in my mind to do a B-Series conversion for quite some time now so i measured up a B18c & it turns out the B-Series engine & gearbox is only between 100mm-120mm longer & will likely fit. I've been playing around with brake upgrades for the red City to find that the front ones i removed from the GA2 City (1988-1993) & calipers bolt straight onto the standard City-E hubs & knuckles, Now with that said the standard City-E disk are 210mm diameter solids but the GA2 City ones are 230mm diameter solids (if they are the original GA2 parts) which are the same size as T2 disks but T2 ones are vented which are that one step better but they don't just bolt on without the T2 knuckles & calipers. 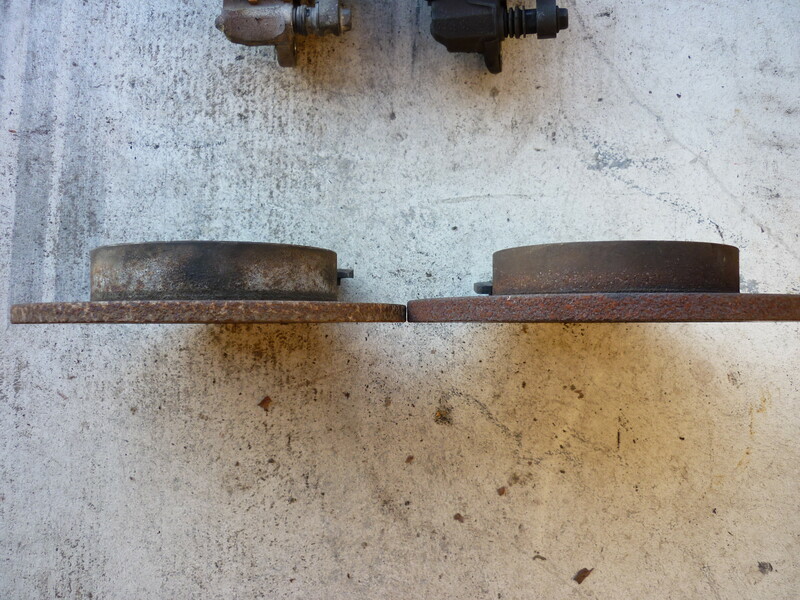 GA2 pads are much bigger than City-E ones so braking performance is likely to be noticeable when working the brakes hard & is a very easy upgrade without having to search for harder to come by T2 brake & hub/knuckle components. One thing to take into account is that the standard 12 inch steely's wont quite fit around the GA2 calipers so some 13's or bigger are going to be needed for this upgrade. For your information T1's have a vented 210mm disk. If anyone is keen to do a GA2 brake upgrade to there first gen City then there are a few things you need to know. First thing to note is that it will only bolt straight up to a City-E which is a NZ new N/A City which uses the larger 140mm caliper bolt spacing's, JDM City's use smaller 110mm caliper bolt spacing's so City-R's & (from memory) Turbo 1 City's are out of luck here but there is a solution & that is to change to City-E hubs & knuckles which will bolt straight up to City-R & T1 City's however its likely you will have to change the outer CV to a City-E one as there are two types of outer CV splines for City's. NZ new use a full length spline & JDM use 3/4 length spline or it's the other way around, i can't quite remember so if you are unsure what I mean well it's to do with the hubs, i'm not sure if you can just change the hubs to get around this (I don't see why not) but its probably just as easier to get the outer's with the City-E hubs & knuckles so then its a straight forward swap over. If you are unsure what knuckles you have then just measure between the caliper bolts, it's wise to check this whether or not it's a City-E.......period! I'm unsure what the Pro-T City in Australia has in it regarding knuckles & hubs but if they are Australian new then its likely to have the same setup as New Zealand new City's, I hope I have my facts right regarding the Pro-T City as I am assuming they are the equivalent to the City-E in NZ, please correct me if i'm wrong. So I had Saturday off work for a change & used that time wisely to hunt around the wreckers for some brake upgrades as it seems to be a common topic here on this site so I thought I would post something about it. 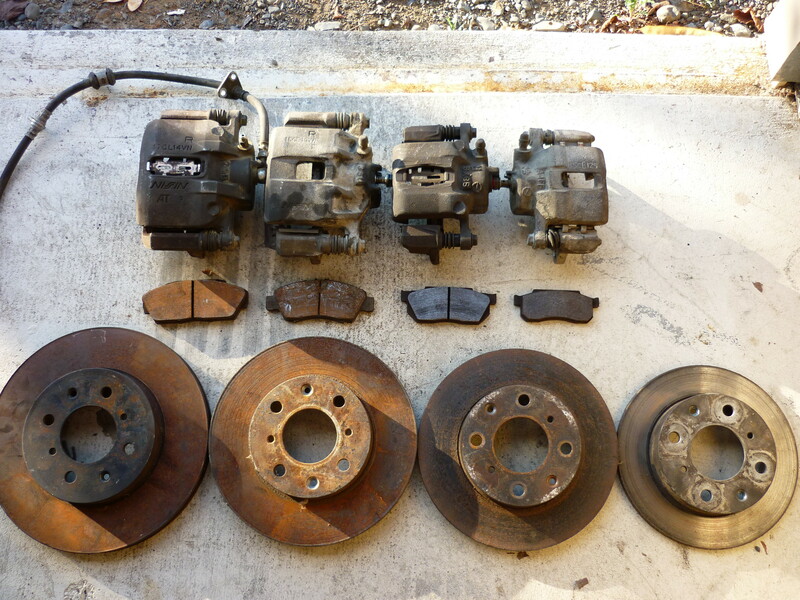 I had never really worried about brake upgrades until I thought more about a Vtec conversion & realized bigger brakes are must if I ever do attempt the B series swap & try to get it road legal, with that said here are some comparisons. Same two disks showing the thickness difference. Here is a comparison between 260's, 240's, 230's & 210's. 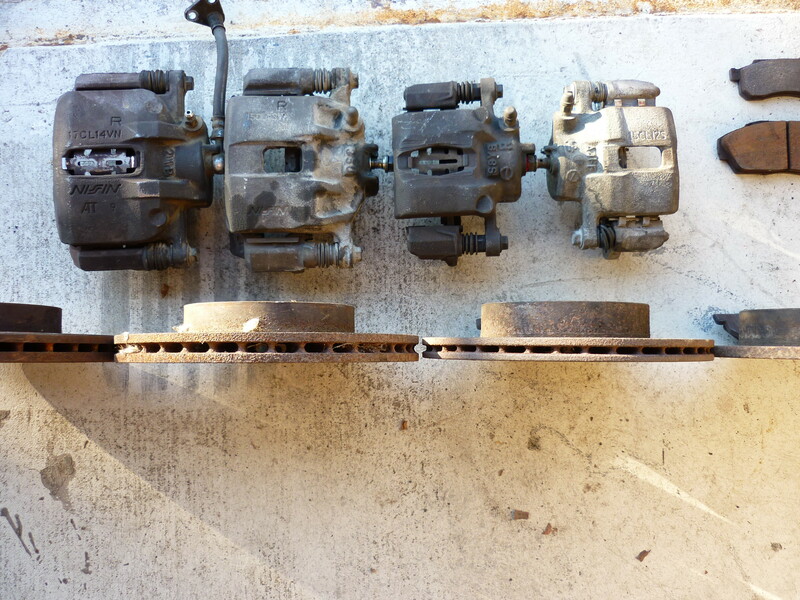 From left to right we have DA6 Integra 260mm vented disk, caliper & pad above then some 240mm DC1 Integra vented disk, caliper & pad above, 230mm T2 disk with GA2 caliper & pad above(I don't have any T2 calipers for a comparison but gauging from the GA one its likely to be around that size) & last we have a 210mm disk, caliper & pad from a N/A City. This is just showing the thickness differences. So with the photos there I will explain some more. I was looking around the wreckers for possible brake upgrades for my N/A knuckles but found basically nothing, they seem to be an odd offset to most other Honda's but found it much easier to find a upgrade for T2's instead which is a good thing considering i wasn't looking for T2 upgrades. First thing to note is that N/A City's use a 40mm offset disk & i'm also sure T1's do to but T2's & i'm sure Cabriolet's use a 45mm offset disk which seems to be much more common in the Honda range, so common in fact that 90% of the cars i looked at had 45mm offset disks, Mazda, Ford, Nissan, Toyota & almost all Honda's had 45's which ranged from mid to late 80's Accords, preludes, Integra's through to the 90's which makes it very easy to find a set. The DA6 Integra disks & calipers are no good for either N/A or turbo City's even thought the disk fits the hub it's the calipers that don't as the mounts on the City knuckles do not protrude far enough out to allow the DA6 caliper to bolt on with that disk even though the DA6 caliper is a 140mm, it also has a thicker 14mm mounting flange than the rest which are 10mm so if they did bolt on then the disk would need to be a 40-41mm offset so it contradicts it's self a bit here. 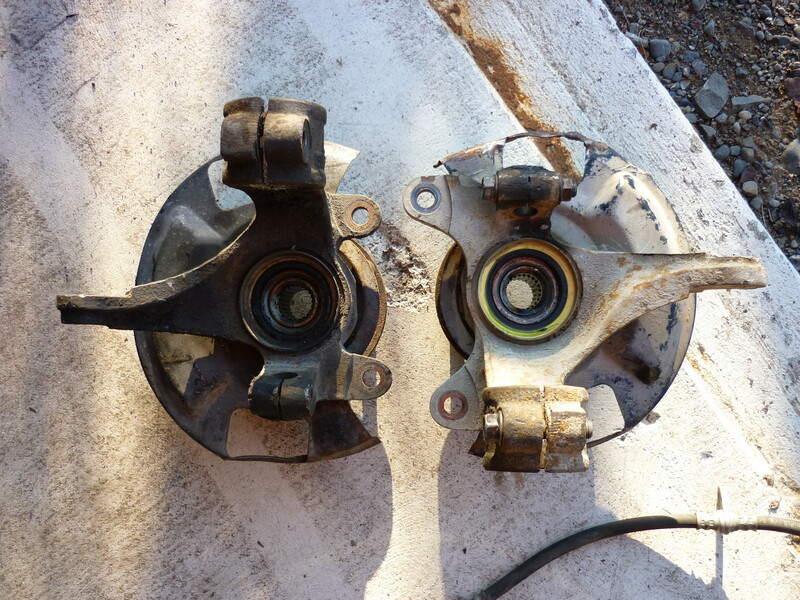 So the other option which i found plenty of was the 240mm vented disks & calipers, i got these ones from a DC1 Integra (1994 on) which has the bug eye (twin) headlight which here in NZ normally means NZ New but in Australia I think only the Australian New Type-R's have those fronts. This DC1 i found at the wreckers had a D16 in it so it's the lowest spec one i believe. DOHC Vtec DC2's use 260's or bigger & maybe even some SOHC Vtecs but i'm not completely sure of this. The 240mm DC1 disks & calipers bolt straight onto the T2 hubs/knuckles & even though some of you may think that its only 10mm bigger than T2's so what's the point well if you look at the photos above you will see even though they are only 10mm bugger in diameter its the larger thickness of them & the considerably larger pad that is going to make a difference especially if doing a lot of hard braking which is going to create a lot of heat which the thinner T2 disks wont handle so well & are likely to brake fade earlier. Anyway i's up to the individual what they think but for a simple straight bolt on upgrade then i feel it is worth it. Good load of info mate! You should probably cross post this to the infobase section, could be very handy stuff. What are you trying to do here in the long run? 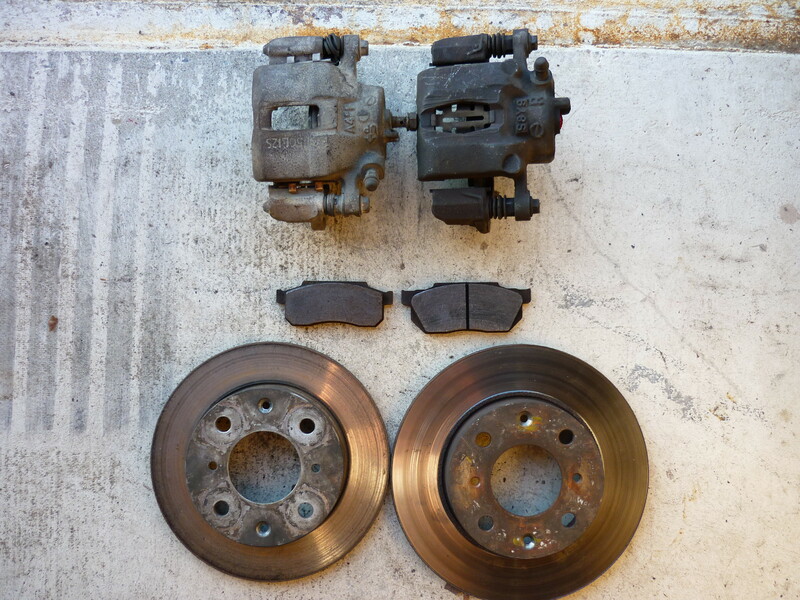 Which brakes on which car? Cool info well done! - With swapping will you end up with a 4x100 PCD or will it go up to 4x114? Seems 95% of cool oldschool rims are 4x114. Nah im giving Turdbo the 240's as I don't run T2 knuckles so cant use them, I just got them for him. I have spare T2 knuckles that I test fitted the 240's on. If you want to get 240's for N/A 140mm knuckles then use GA3 ones, they come off the TS version Honda Logo which uses larger 240's, that's what I have just put on the GA2 City, this is why I have taken the disks & calipers off the GA2 City & put them on my Turbo City. As for what im trying to do well its winter time & I was bored so thought i'd go suss out some brake options to help guide other City enthusiasts but I do plan on doing a bigger brake setup as its going to be needed later on with the B-series conversion so just looking around for options at the moment. I really am aiming to get 260's on there & there are a couple options but cant find calipers to suit. Nah man still 4x100, I don't want to have to change hubs to a 4x114 configuration but it could be done if you found the right one that will fit the City knuckle or a custom made one but its probably easier to just get the wheels drilled to suit PCD. Hey just wondering if you run bigger injectors and if so what cc and from what? I remember you had some bigger ones for sale a while back but was unsure what you're using now? Hey man, yeah I had some gen1 B16a injectors & some from a B20 Prelude which are the same. I stopped using them as they were noticeably more hungry on fuel & because the T2 injectors were up to the task but found that standard T1 & T2 injectors cant handle the high fuel pressures when running 20psi & over, I've cracked 3 in the last year when running high boost, not to sure if its just a coincidence since they are old or because of high boost but haven't had any issues with the B-series ones. Standards are between 180cc & 190cc & the B-series ones that I used are 240cc so i've read. If you only run a max of 18psi your standard injectors should be fine. Nice work! I was wondering about this the other day, does Honda do twin or four put callipers?